The Aeroplane Factory is proud to be involved in the restoration of a Temco Buckaroo. The Buckaroo was originally conceived as a tandem trainer version of the Swift. The project started in 1948 after Temco received a request for such an aircraft from the Philippine government. 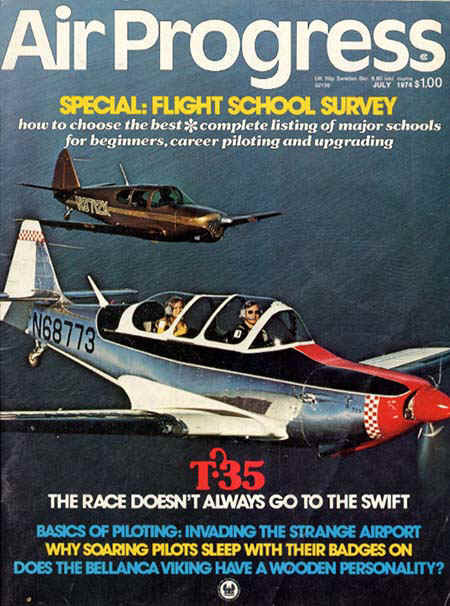 While the prototype drew heavily from the Swift, the final production version, designated T-35 by the USAF, was much changed and had many features and parts different than those found on the Swift. As the various parts of the Buckaroo arrive at The Aeroplane Factory, fixtures will be made for each part before they are taken apart. All parts will then be completely disassembled, cleaned, and inspected. Damaged parts will be used to make form blocks so new parts can be made. All parts will be primed with epoxy primer (zinc chromate color to match original) before assembly. The parts will be re-assembled in the fixture. by Budd Davisson from the July 1974 issue of "Air Progress"